Combine water, sugar, and salt in the bowl and stir to dissolve. Transfer to mixer along with 1½ c flour and mix for several minutes, scraping down sides as needed, until smooth. Gradually add the rest of the flour and mix until it forms a ball. Lightly flour the counter and turn out the dough. Knead for 5 minutes, until smooth. If it’s very sticky, add a bit more flour. Cover with towel and let rest for 10 minutes. Roll a piece of dough into a ball, flatten into a disk, and press your thumb and pointer finger together to make a hole. Stretch and smooth the dough into a ring. Repeat with remaining dough, then cover and let rest 10-15 minutes. Fill pot with water, add sweetener, and bring to a boil. Lower water to simmer, add 3 or 4 bagels without overcrowding, and simmer for 3 minutes. Flip each bagel and simmer another 3 minutes, then transfer to rack to drain. 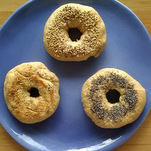 Add more bagels to the water, then sprinkle your chosen toppings on the already boiled bagels, pressing them in slightly. Once all the bagels are boiled and topped, transfer to the baking sheet and bake for 30 minutes. Notes Make some flavored (vegan) cream cheese to spread on top, or use in place of bread for sandwiches. 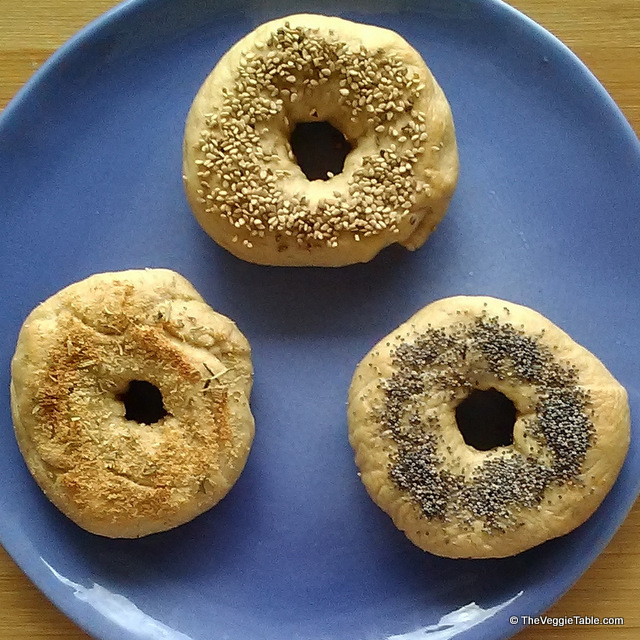 Adapted from the recipe for “bakery-style bagels” in Vegan Baking Classics, by Kelly Rudnicki.